Electronic push button key pad operated safe. Program safe to open/close with 4-6 digital code and/or any credit card. The high security mechanical key lock is located under the chrome plate on the face of the door. The CEU has multiple Functions. 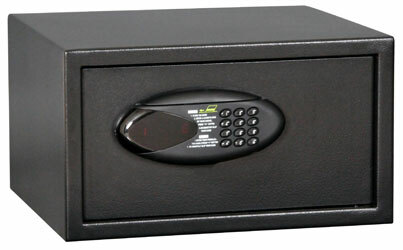 Electronic override system: Allows you to open the safe in case of an emergency. Emergency power supply: Allows you to open the safe when battery power is depleted.